March 19 — Our first night at puppy kindergarten class was…mellow. Truman had just had his nine-week puppy shot, so he was deceptively calm and gave no resistance when I cradled him. No resistance whatsoever. Nighty-night, little man. I remember that Rockwell was also subdued after his shots. He even fell asleep in the car on the way home. With what you’ve been describing, you may have a pup who is a lot like Rockwell. Which is good and bad, as we know. I hope you get some quality assistance on the few bad bits. I never did figure out how to get him to obey me when he was in one of those moods. But then, I’m not very Alpha.I adore his ears in this photo. And the wrinkly face and crossed paws. I bought Vienna the exact same blankie when I got her… but hers was pink. :)and it didn’t have writing on the bottom. He’s soo cute!!! gosh his paws look big in this photo. 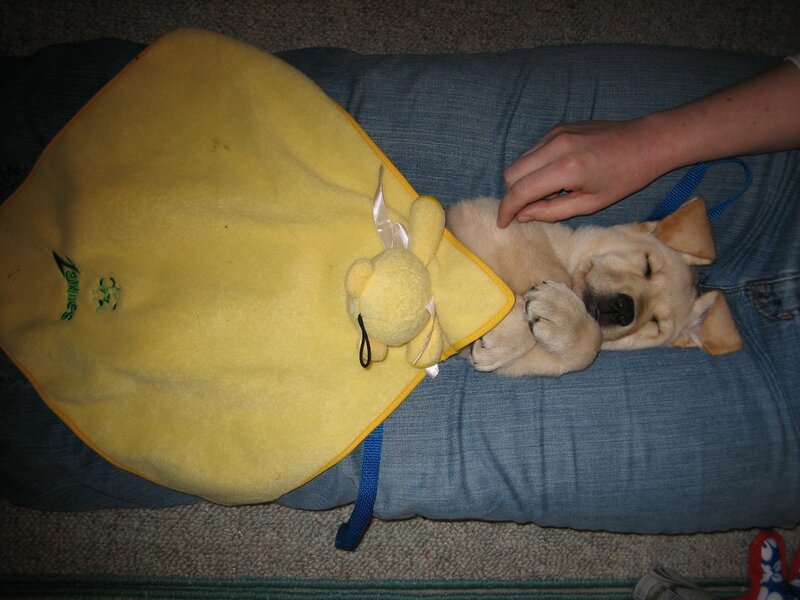 That is one seriously cute puppy pic….Not that I envy you the puppyhood days one iota LOL! That picture is SO cute Jenny!! I love it!I think you should mail him to me! Ssshhh! You’ll wake the baby.